The dash came out a few weeks ago with little drama. After unhooking the HVAC ducting and removing (what I thought) were all the fasteners, I disconnected the cables from the heater box and tried to pull it out. No dice. Turns out there are a pair of bolts at the very corners of the dash pad up near the base of the windshield that I had missed. These removed and a little elbow grease brought the whole assembly out the passenger door without much trouble. Once out, I took out the heater box. Many of the flappers were rusted in place; will have to go over this, free them up and recondition. 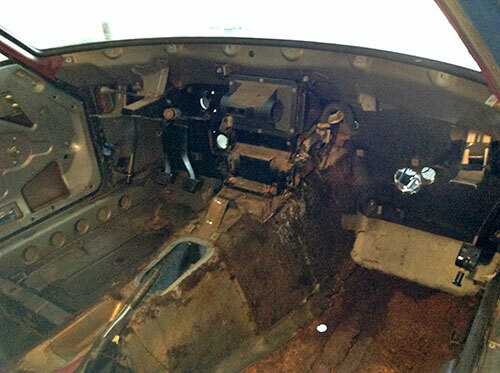 I removed the firewall insulation, fresh air ducts and hooked up the steering column again. The brake and clutch pedals and a few other things are attached to the column mounting bracket. Once it’s removed they’ll come down too. All the car’s wiring harnesses converge behind the glovebox area, so it took a fair amount of labeling with blue tape to keep everything straight. I’ve been religious about keeping fasteners in labeled bags, but it occurred to me that I’ve been neglectful in simply keeping a record of the sequence in which components have been removed from the Z. Without this, it’s going to be a real mystery come reassembly time as far as what gets reinstalled first. Beyond the remaining few bits I need to remove under the rear of the car, my task now, before too much time passes, is to go over the car and remember the order in which I removed bits. Shouldn’t been too hard, and even if I’ve forgotten a thing or two, whatever I have should be a good guideline to go by. Deconstruction is coming along! 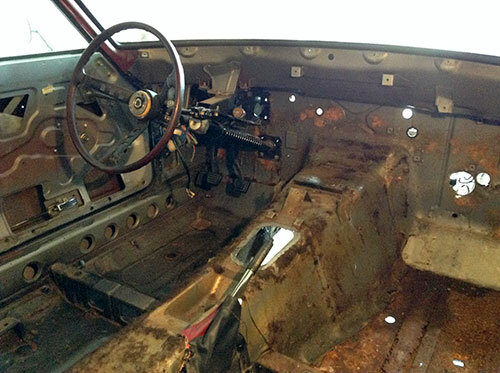 What’s next… body work then paint? Yessir. I still need to do some little things like disassembling the fenders and seeing how much of the window framing I can pull off, but by and large she’s ready to go.